The Kraken first came to the attention of the world in 1751 due to the publication of the Natural History of Norway, written by Erik Pontoppidan [1698~1764 CE], bishop of Bergen. The Kraken, also called the Kraxen or Krabben, was easily mistaken for an island when at the surface of the Norweigen oceans; the creature never fully came into view due to its immense size, and its mostly underwater existence. Because of this, the actual size of the Kraken was something Pontoppidan couldn’t tell us, but he generally described the creature as "round, flat, and full of arms, or branches." During hot summer days the Kraken often rose to the surface of the seas near Norway; it never came to the surface during rough seas or bad weather. The beast was usually encountered anywhere offshore that was at least a depth of 80 fathoms. If a depth check by fishermen came back as less than thirty, it was assumed a Kraken was under the boat. Because Krakens actually attracted fish, there were always big schools – especially of cod or ling – in the water above the submerged beast. So if a Kraken was located, sometimes up to 20 boats would gather above it to catch the plentiful fish. But if the depth of the Kraken showed that it was rising to the surface, the fishermen had to row away until they detected a normal depth for the area. Soon after, the back of the creature would rise to the surface, looking like a number of small islands surrounded by sea-weed, with stranded fish flopping about until they reached water again. Next, a number of “horns” rose up, as tall as the masts of middle-sized ships, thicker at the base than the top. Pontoppidan felt these were the arms of the creature, used to move it around. He stated the visible area of the creature’s back was estimated to be a mile and a half in circumference, but also stated that he chose to present the smallest estimation the fishermen gave him, “for greater certainty.” After a short time, the Kraken slowly re-submerged, creating swells, eddies, and a whirlpool that sucked everything too close down with it. The Kraken spent several months eating, followed by several months excreting. This excretion colored and thickened the water, but was exactly what fish found highly attractive. Great schools of them gathered above the Kraken to eat this waste… and then were eaten by the Kraken. Pontoppidan stated that the Kraken could probably grab a boat and drag it under if it chose to; however, it was never actually known to be aggressive and he did not state that it had ever actually attacked anyone. All human deaths and injuries caused by the Kraken were accidental, and generally due to fishermen not reacting fast enough to the Kraken’s presence. The bishop tells that “a few years ago near Fridrichstad,” a small boat with two fishermen came too near a rising Kraken, and could not get away in time. One of the creature’s ‘horns’ crushed the front of the boat, and the fishermen clung to their floating wreck until they got back to shore. Pontoppidan also relates an account from the Reverend Friis, Minister of Nordland. In 1680 CE, what was assumed to be a young Kraken swam into the waters between the rocks and the cliffs in the parish of Alstahaug. In moving about, it tangled itself up in the rocks and caught its ‘horns’ among trees near the water; unable to escape, the beast eventually died. Its body took a long time to rot away, and the stench made the area intolerable… unfortunately, no one took measurements or drew a picture of the body. And so concludes Pontoppidan’s report on the Kraken, to which he added his beliefs that the beast is a form of polyp or starfish, and that it is possibly responsible for other reports of vanishing islands worldwide. Over the next fifty years, the popular idea of the Kraken was altered due to confusion -- both accidental and purposeful -- and the difficulty of locating a copy of Pontoppidan’s book. First, the Kraken tale was soon mixed up with previous stories of living islands from many places, and with tales of sea-serpents of any description; soon, any such report was treated as evidence of the Kraken, even if what was described didn't match what Pontoppidan had originally stated. Then, in 1801, a Frenchman named Pierre Denys de Montfort [1766–1820 CE] published a book meant to prove the existence of giant octopuses; and to help his book sell, he claimed that the Kraken was actually a type of giant octopus. He stated that the reported “horns” were actually arms and tentacles, and the fish-attracting excrement was octopus ink. He also included an illustration of a giant octopus pulling a boat under the water, and claimed that Pontoppidan stated that Krakens did this (which he hadn’t). Montfort’s book was laughed at by serious minded people; but by 1819 naturalists and scientists began to find decent evidence for the existence of the giant squid, and started to believe Denys de Montfort’s claims regarding the Kraken... except they suspected it was a squid instead of an octopus. In 1870, the book 20,000 Leagues Under the Sea, by Jules Verne [1828-1905 CE], proved to be enormously popular. 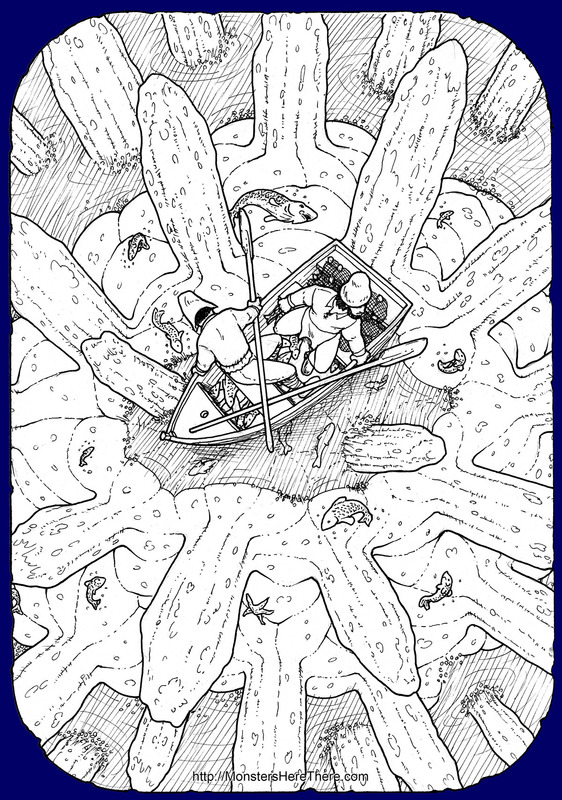 In this story of a sub-marine adventure, Verne makes many mentions of the Kraken and Pontoppidan, and also has a scene in which the lead ship is attacked by a giant squid... which, combined with the then stated opinion of many learned men about the Kraken and the giant squid being the same creature to start with, largely cemented the new public idea of this being correct. The only weakness with the “Kraken as giant squid” argument is that Pontoppidan knew the difference between a squid and a starfish - he described species of both in the same chapter of his book in which he describes the Kraken - so he was not confused about what he was reporting. The bishop was very clear that he felt the Kraken was, in fact, a gigantic starfish; and perhaps it is still in the oceans near Norway, waiting to be truly re-discovered.